Grain spirits and whiskeys are a relatively new product and technique for us. Robert from Koval Distillery in Chicago shared his whiskey recipe with us when he came to help install the still. We mix flour with boiling hot water in a 150 liter stainless steel cauldron on wheels. The vat is enveloped by a water jacket making it possible to cool the brew by running cold water through this casing. Two different types of enzymes are added to break down the starch in the mash and ready the batter for the yeast and then fermentation. Ideally when the mixture is done, all the starch has converted to sugar and the conditions are thus ripe for optimal alcohol production. 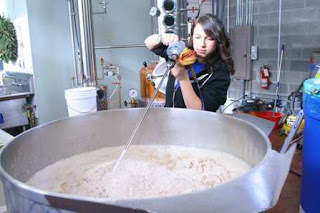 The whole process from the heating of the hot water to bucketing the mash into the fermenter takes us about five hours.